The TKN group has a long tradition in investigating performance issues of WLANs. We focus particulary on IEEE 802.11 WLANs systems and beyond, e.g., HIPERLAN, Bluetooth and HomeRF. For the sake of doing research a IEEE 802.11 WLANs model first was implemented in Ptolemy. Because of some inefficiency in the implementation of the model and the tool itself at the time the model was finished we decided to re-implement the IEEE 802.11 simulation model. We choose CSIM18 because of its slenderness and simplicity resulting in a very good simulation performance. Another reason was, that CSIM18 allows students and persons with medium C/C++ programming skills to become familiar with the tool within a few hours. is a standard which specify the medium acces control (MAC) and physical layer (PHY) of an WLAN. The basic standard, which incorporates a CSMA/CA-based random multiple access scheme and three different physical layers (DSSS, FHSS, IR), was released in 1997. In 1999 an extension was passed (IEEE 802.11b), which basically extend the existing transmission rates of 1 and 2Mbps by 5.5 and 11Mbps. A new physical layer (IEEE 802.11a) based on OFDM supporting up to 54Mbps will be released soon. The MAC protocol remained almostly untouched during the upgrades. It supports adhoc and infrastructure operation modes. In adhoc mode, the medium access control is distributed among all mobiles while in infrastructure mode a dedicated station (Access Point) seizes the access control. Both modes of operation can co-exists since they are based on the same CSMA/CA access mechanism. The simulation model was implemented in C++ using the CSIM18 library. In Figure 1 the model structure is shown roughly. 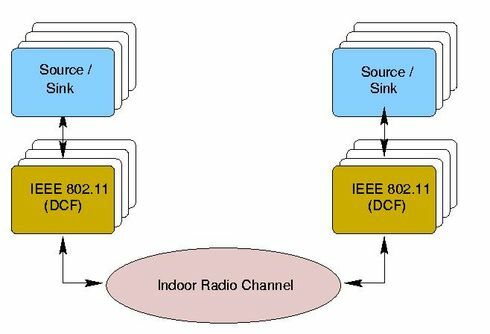 Basically, the model consists of a radio channel, a mobile station, and several source modules. In addition, a access point module exists. The mobile station module (as well as the Access Point module) consist of almost only MAC functionality and simplified transmission functionality. Almost every MAC sub-mechanism was implemented (e.g., MAC packet fragmentation/assembly, NAV, RTS/CTS, access point scheduling, etc). A major yet missing feature is the power save functionality which will be available soon. J.-P. Ebert, B. Stremmel, E. Wiederhold and A. Wolisz, "An Energy-efficient Power Control Approach for WLANs", in Journal of Communications and Networks (JCN), publication ofKorean Institute of Communications Sciences (KICS) , vol. 2, no. 3, pp. 197-206, September, 2000, postscript, pdf. Please check here for the papers.